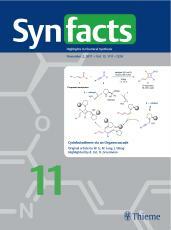 Every year, Synfacts reviews the most-read highlights published in their journal. It was a great pleasure to see that two ICIQ papers appear in 2017’s top-10. In one of them, Benjamin List and Francesca Mandrelli review the work of Prof. Paolo Melchiorre on the asymmetric formation of quaternary carbons by iminium-ion trapping of radicals, published in Nature in 2016. (Synfacts 2016, 12, 0739). The other, written by Hisashi Yamamoto and Amit Banerjee, highlights the work of Prof. Arjan Kleij on the Pd-catalysed asymmetric sythesis of α,α-disubstituted allylic N-arylamines, a study published in JACS in 2016. (Synfacts 2017, 12, 0043). Both articles will be available for free until the end of February. Moreover, remember that as a part of our recent agreement with Thieme Chemistry, we have access to their journals Synlett, Synthesis and Synfacts until June 30th 2018.